It's built into our British DNA to welcome anything that promotes cosiness, and this is why shopping for a new winter coat—or, as you'll see below, new knitwear—is a task we welcome with open (slightly chilly) arms come autumn. Maybe we were mastering the art of hygge before the Swedes; think fluffy blankets, cups of tea on repeat, bracing walks with the family, and an excess of cashmere, wool and mohair. 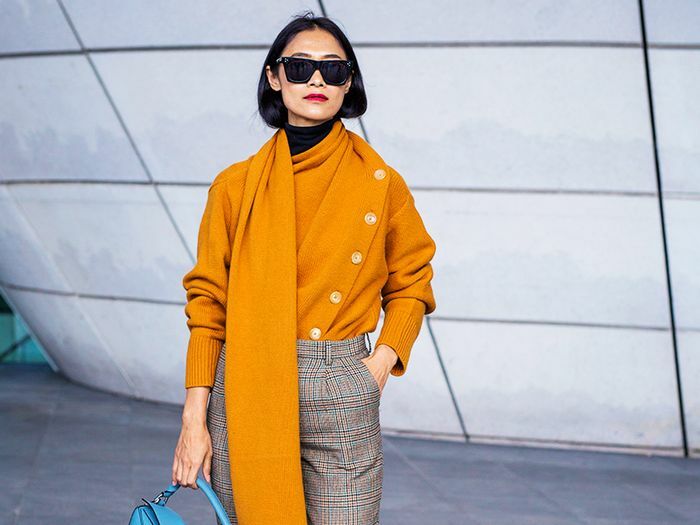 With the return of the cardigan and It jumpers (like the orange Joseph knit) reaching cult status, it's no surprise there's a style out there this season to suit everyone. Luckily we've tracked down all the ones you've most likely screenshotted on social media. From the next Ganni sweater that's already taking over your feed to the neon Weekday knit you've probably already liked and saved, we're ready for these jumpers this season. Naturally, our fashion friends are offering up new ways to style our favourite jumpers right now for inspiration. The great thing about this piece is that if you chose the right one, it'll have the same longevity as a classic leather skirt or trench coat you bring out year after year. Style Notes: Acidic hues are surprisingly everywhere for autumn/winter. Make like Alexis and wear your bright knit with a contrasting accessory. Style Notes: It's the jumper everyone (including us) has been raving about. The Joseph jumper-scarf hybrid is here to stay. Style Notes: If you're a more adventurous dresser, you know that if Tiffany wears something, it's time to take note. This is the case for the off-the-shoulder knit we now want to own. Style Notes: Embrace the cardigan and your life will change for the better. They'll go with everything from slip skirts to your new cord trousers. Keep it buttoned up to wear as a jumper and clash like Emili for extra kudos. Style Notes: If you're like Beatrice and like to make pastels work through the year, opt for a soft mohair sweater. You'll end up wearing it tonal (as above) or with every colour from tan to orange. Style Notes: While Jessie styles her lilac transitional knit with Kitri checked trousers and a Shrimps bag, you'll also end up wearing it with jeans, cords and midi skirts. Style Notes: Go bold and clash multiple checks for a look that will brighten up the dullest of winter days. Style Notes: Statement sleeves work year-round, and you only have to look at this chunky cable-knit to agree. Wear with a silky slip skirt to balance out your silhouette. Style Notes: We've already tried out all the best brown new-in pieces, and this ribbed sweater needs to be added to the list, stat. Try wearing the colour head-to-toe just like Amy. Style Notes: If Ganni's cult buys are up your street, look no further than its latest addition. This simple but effective colour-block sweater moves on from the brand's popular rainbow knits. Want more winter warmers? These are the 40 coats we predict will sell out pretty quick.